The post All About the Perro de Presa Canario by Allan Reznik appeared first on Dogster. Copying over entire articles infringes on copyright laws. You may not be aware of it, but all of these articles were assigned, contracted and paid for, so they aren’t considered public domain. However, we appreciate that you like the article and would love it if you continued sharing just the first paragraph of an article, then linking out to the rest of the piece on Dogster.com. There are a few large working breeds whose fearless guardian traits are so pronounced that canine experts would never recommend them for the average home. Two such dogs are the Fila Brasileiro (Brazilian Mastiff) and the Perro de Presa Canario (Canary Island Dog of Prey). In the right, experienced hands, and given a job to do, they can serve their owners well, but their strength, dominant temperament and potential for aggression make them completely inappropriate for most situations. 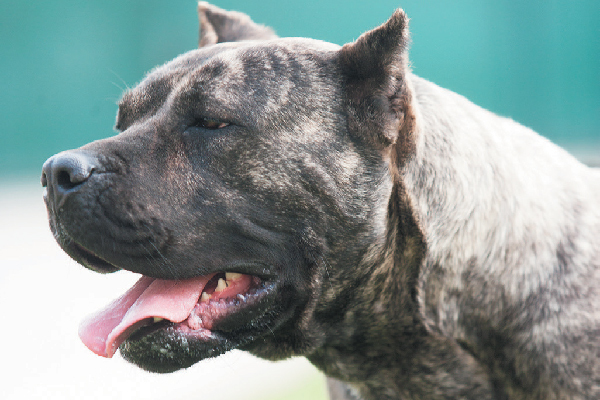 Let’s learn more about the Perro de Presa Canario here. Perro de Presa Canario. Photography ©Marko_Marcello | Getty Images. The burly Perro de Presa Canario hails from the same islands as the sweet songbird and popular pet. Originally bred for working livestock, Perro de Presa Canario is Spanish and means “Canarian catch dog,” often shortened to Presa Canario or simply Presa. The breed is also known as the Dogo Canario, meaning Canarian Molosser. In addition to its role as a cattle dog, Presas were used for dog fighting until the 1950s. Although the prohibition of dog fighting was ordered throughout the islands in the 1940s, the activity secretly continued for the next decade. With the introduction of the German Shepherd Dog, the Doberman Pinscher and the Great Dane to the islands, interest in the Presa dropped off significantly, almost causing the breed’s demise. In the early 1970s, a few committed breeders made a concerted effort to revive the Presa, citing it as a rustic, functional dog with highly prized watchdog instincts, territorial and courageous. The Presa’s appearance is that of a typical molosser, with a broad, massive and square head; a thick, muscular body and rectangular profile. The ears are typically cropped, not only to give a more formidable expression but also to protect the dog from harm while working with cattle. Height ranges from 22 to 26 inches; weight from 84 to 110 pounds; and the short coat, which is slightly coarse to the touch, comes in all shades of fawn and brindle, with a black face mask. Given the pronounced aggression that is so much a part of both the Fila and the Perro de Presa Canario, many countries have banned their importation, ownership and breeding. In Fiji, the United Kingdom, Denmark, Norway, Malta and Cyprus, it is illegal to own a Fila without specific exemption from a court. In certain states of Australia, the Fila is a restricted breed. Imports are also prohibited. Importation and sale of the Perro de Presa Canario is prohibited in Australia and New Zealand. Thumbnail: Photography © Paul Fearn | Alamy Stock Photo.